Back in 2011, the whole world watched as an earthquake and devastating tsunami slammed into the Pacific coast of Tōhoku, Japan, destroying towns, causing nuclear meltdown scares, and displacing families in its wake. More than 15,500 people were confirmed dead in the disaster, and many others are still missing today. Many beloved pets were also killed in the tsunami, which is exactly what 64-year-old Kazuko Yamagishi and her husband, 67-year-old Takeo Yamagishi, believed had happened to their cat. 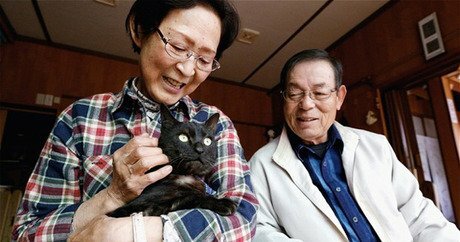 The Yamagishis had loved and cared for their black Domestic Shorthair, Suika (which is Japanese for “watermelon”), for more than 12 happy years. But after the tsunami hit near their home in Ōfunato, little Suika went missing. Kazuko and Takeo were devastated. For three long months, they searched the area for Suika, but to no avail. The Yamagichis grieved, believing Suika had likely perished in the tsunami. Little did they know, Suika did survive, and for three years, he likely lived a few short miles from home. On April 10, a couple was taking a walk through the pine forest in Rikuzentakata, a town near the Yamagichis’ home in Ōfunato, when they spotted a black cat sleeping under and tree. Approaching the cat, they could tell he was friendly, and the collar he wore was a clear sign he was someone’s pet. Hoping someone would come to claim the kitty, the couple brought him to the Ōfunato Health Center, where a staff member noticed faded lettering on the cat’s collar. Looking closely, he could just make out the name “Yamagichi” and a phone number. When the health center staffer called the number on the kitty’s collar, he was able to reach the cellphone of Takeo Yamagichi, who couldn’t believe the wonderful news — after three long years, Suika was alive and well. The Yamagichis could barely contain their emotions upon seeing Suika again. “Where have you been?” Kazuko asked her long lost kitty during their emotional reunion. “It’s just like a dream,” she told Japanese newspaper The Ashashi Shimbun. Kazuko and Takeo weren’t the only family members overcome with joy at the news Suika had returned. The Daily Star reports that the Yamagishi’s 36-year-old daughter wept with happiness when she learned her family’s cat had finally been found. While it is unclear how Suika managed to survive one of the most devastating natural disasters in recent memory, or how long he’d been living in that pine forest, people at the health center believe someone had been caring for the Yamagichis’ lost cat. While Suika’s collar itself was very old and worn, someone had attached a new bell to it.